And perhaps nothing illustrates this conventional wisdom better than a chart spreading like wildfire on social media. Its supposed aim is to help citizens monitor the economic success of Donald Trump’s presidency, but it’s real intention is to dupe the economically naïve into thinking Trump’s tenure was a fiscal failure. It was first posted, from what I can tell, on a Facebook page by “The Other 98%,” a liberal outfit notorious for disseminating far-left propaganda. Or, in layman’s terms, to mislead voters via alternative facts. 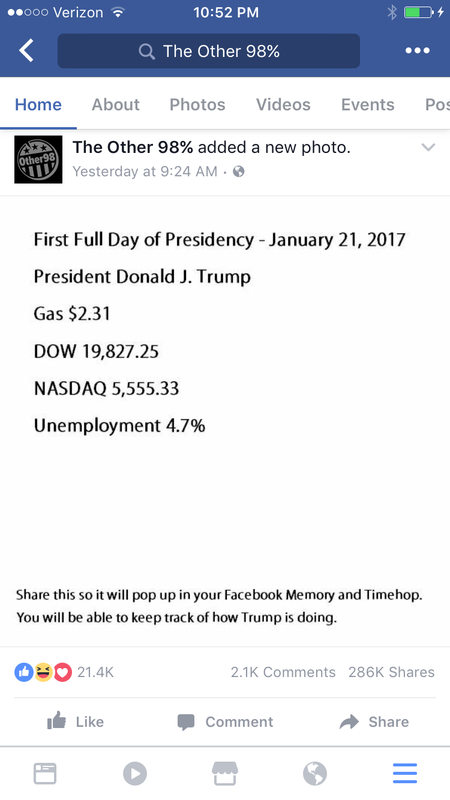 The chart is supposed to be shared to followers’ Facebook pages, where it will pop up each year in their “memories,” allowing them to monitor Donald Trump’s economic performance as president. An interesting concept to be sure. And a popular one: it had more than 21,000 reactions and was shared more than 286,000 times as of January 26. The problem, however, is with the disingenuous nature of the metrics in the chart. They are gas price, the NASDAQ, the DOW, and unemployment, none of which are reliable indicators of a President’s economic performance, and several of which have been chosen for their ability to mislead. But in the spirit of good will, let’s play along, starting with gas. According to the picture, it costs an average of $2.31/gallon on January 21, the first full day of Trump’s presidency. Fine, whatever. Considering Trump’s pledge to make fossil fuels great again, and his recent executive orders to renew the construction of two pipelines, I’m not particularly worried about him falling short on this particular front. The gist, of course, is that there’s a whole world out there, one largely out of reach of the American President. While it is true that Presidents do exercise some minor influence over the price of fuel, such as through drilling policy, the fact that the U.S. consumes about ten times more oil than it produces demonstrates perfectly that the influence of executive policy only goes so far. After all, I doubt The Other 98% was blaming Obama when gasoline approached $4/gallon in 2012. But in terms of deception, gas prices are child’s play. The chart’s intellectual dishonesty hits full throttle with its citation of the stock market figures the day Trump took office—19,827.25 for the Dow and 5,555.33 for the NASDAQ. For starters, the Dow is at an all-time high, and much of that rally began after Trump was elected, three months before he took office. In fact, Trump’s election victory coincides with the biggest post-Presidential market climb since 1900; the NASDAQ has likewise soared, gaining nearly 9 percent since November 8. Perhaps the stock market figures should begin in the second week of November, not the third week in January. By citing the figure for the day he took office The Other 98% is robbing Trump of some of the gains he earned. And because it’s at an all-time high, The Other 98% is gambling on a “Gotcha!” moment four years from now because, well, there’s nowhere to go but down. This, my friends, is what we like to call “cherry picking” data. Of course, one could easily argue that much like gas prices, the markets also function largely outside of economic policy. That there are too many outside drivers pulling the levers, and that stock prices are dependent on much more than say, corporate tax rates. That it’s a global economy, and Trump is but one man. But given the numbers and the timeframe, it’s hard not to give The Donald a good portion, if not most, of the credit for the recent gains, much of which occurred in the interim after Trump’s victory and before Inauguration Day. And that brings us to the last metric, and one that the President undoubtedly has the most control over: unemployment. The 4.7 percent number cited on the chart is pretty low historically speaking, making it very hard for Trump to trump, something The Other 98% knows all too well. But it’s hardly anything to celebrate. The unemployment figure so beloved by Trump’s predecessor comes with several caveats, the most important of which is that in order for someone to be considered “unemployed” they must be looking for work. During the recession many simply gave up, preferring instead to work under the table or simply live off the state, as the growth of entitlements under Obama demonstrates. There is also ample evidence that those considered employed are grossly underemployed, i.e., working part-time or making less than their peers with similar qualifications. So while the number is indeed low, it’s disingenuousness is high. A better metric would be the labor force participation rate, or the number of Americans employed or unemployed but looking for a job—2015 saw the labor force participation plummet to its lowest point in 38 years, meaning that Obama oversaw one of the most discouraging worker economies in modern history. Come to think of it, there’s no shortage of better starting points with which to judge Trump’s success in managing the economy: median wage, total national debt, real unemployment, you name it. But by focusing on gas, which presidents have little control over; on the markets after Trump took office, which had already climbed considerably thanks to his election victory three months earlier; and on unemployment, which excludes people who have stopped looking for jobs and fails to account for full employment, The Other 98% is practicing a special brand of political hoodwinks. The fact that The Other 98’s little chart has been shared nearly 300,000 times speaks volumes about the people who follow it—and the economic ignorance that has come to plague the left. The stock market average P:E just recently reached a new peak, second only to the one just before the 1930 crash. That bubble’s gonna burst soon, no matter what.